What caught the Gloucestershire Copywriter’s eye this week? I thought I’d try something completely different this week and flag up three things with writerly connections that caught my attention on radio and TV last week. As a professional writer who knows what it’s like to get in the zone with business copywriting, novel writing and even a bit of songwriting, I could relate to this. I just liked it, the story of how what is arguably the greatest rock song of all time was substantially written and recorded in two or three takes one afternoon. The week’s guilty pleasure came after reading a tabloid article about the ITV series Ladies of London. Although I can’t stand soaps, reality TV is another thing and I couldn’t resist a peek at one episode – and then another. There’s something worryingly compulsive about this hugely contrived fly-on-the-wall look into the lives of several British and American London socialites as they cat fight, quaff Champagne and do the rounds of London’s society events. As an SEO copywriter, I was particularly interested in one scene of Episode 1. That was when the oh-so-in-control (and very successful, with her upmarket Gift Library website) Caroline Stanbury’s marketing team announced that they hadn’t got the functionality to change any of their own keywords in the website copy. Oops! So rich, so cool but… such a schoolboy (or schoolgirl) online marketing error. And then there was George Clarke’s Amazing Spaces on Channel 4 and his helicopter trip (helicopters: now that immediately caught my attention) to the amazing Gervasutti Refuge at 2833m in the Mont Blanc Massif. Constructed in 2011 to replace an earlier refuge, this ultra-modern, completely temporary, prefabricated pod by LEAPfactory offers sleeping accomodation for 12 people, broadband, solar power and the most amazing views imaginable over the Val Ferret’s Freboudze Glacier, in front of the east face of the Grandes Jorasses of the Mont Blanc range. And what did I think? How that would make an amazing copywriter’s studio – if only one could keep one’s eyes on the work and not on the jaw-dropping scenery. Whistley Hill overlooking Charlton Kings is lovely, and inspirational, but the Gervasutti Refuge is something else again. The newly-remastered Led Zeppelin IV, an episode of Ladies of London (well, maybe not) and a week in the Gervasutti Refuge with Mrs H. The climb out of the Val Ferret is a long, hard one if you don’t take the chopper, but surely a stairway to copywriter heaven. This entry was posted in Copywriter rants, Copywriting Resources, Uncategorized and tagged business copywriting, copywriting refuge, george clarke's amazing spaces, gervasutti refuge, gloucestershire copywriter, helicopters, jimmy page, ladies of london, LEAPfactory, led zeppelin, seo copywriter, stairway to heaven on October 27, 2014 by alwrites. Rio’s sprawling hillside favelas – shanty towns – are a long way from this Gloucestershire copywriter’s beat. And they might seem a strange place to find a reminder about the importance of graphic design and copywriting working together for the clearest possible communication. But that, indeed, is what I saw on an impressive BBC2 documentary last night. I was watching Part 1 of BBC’s pre-World Cup documentary series Welcome to Rio. I’m not a massive football fan, but it looked interesting and, having recently spent a couple of days in Brazil, I decided to watch. The programme, which looked at the lives of people living in Rio’s favelas, gave a fascinating insight into the challenges faced by the residents as they survive with pirated electricity, broken white goods salvaged from Rio’s posh districts and inspiration from some of the most stunning dawn views over Copacabana beach and Corcovado. The Cantagalo residents featured in this observational series included Brazilian ‘Banksey-style’ graffiti artist Acme. In one scene, Acme is communicating his feelings for the enforced dismantling of the favela with an impressive artwork featuring an octopus (the authorities) and a shark (the people). As he finishes the metres-long painting, a police officer asks what it is about, drags out of Acme the notion of oppressed people battling against the establishment, then suggests that a few words might make the idea easier for everyone to understand. And there was the lesson. Too often, as a busy Cheltenham copywriter, I get called into a project when the brochure design is complete or a website is nominally ‘finished’. I do my best, but how much better it is for the client when I work alongside their graphic designer or website company from the start to produce a design solution where words and images complement each other and communicate the desired message. In fact, since returning from South America, I’ve been working with Stroud-based graphic designer Sam Hemmings (Design Fibre) to create a new brochure for retail location specialist Maximise (UK) Ltd. The project was a joy, with a fantastic client and great chemistry between Sam and I as the classic copywriter-designer creative team. Oh yes! As that Rio cop explained to the exceptionally talanted Acme, perfect communication comes when words and design work together. Now, let’s hope that the England team gel as well as Sam and I did when they take to the pitch in next month’s World Cup. This entry was posted in Copywriting ideas, Uncategorized and tagged acme, banksey, brazil, brochure, communication, copywriters in cheltenham, copywriting, design fibre, gloucestershire copywriter, graffiti artist, graphic design, sam hemmings, welcome to rio, world cup on May 28, 2014 by alwrites. There’s inspiration out there, not necessarily in ‘them thar hills’, but in the writings of the good and great of copywriting and journalistic writing from bygone days. And I’ve been reminded of a couple of gems that can help everyone who writes for business – including you. With the fast-pace of technological change, we’ve become used to computers and phones being out of date the day we buy them. But in the world of business writing, the pace of change isn’t so fast and loads of advice that worked decades (or even a century) ago still holds good today. You only need to read Claude C. Hopkins‘ My Life in Advertising and Scientific Advertising to get this. Amongst other things, Hopkins was the brain behind the famous, and still influential, Schlitz Beer ads that are always being quoted in advertising texts. Nobody should be allowed to have anything to do with advertising until he has read this book (Scientific Advertising) seven times. It changed the course of my life. You can read Scientific Advertising online for free (or buy the combined books in hard copy). 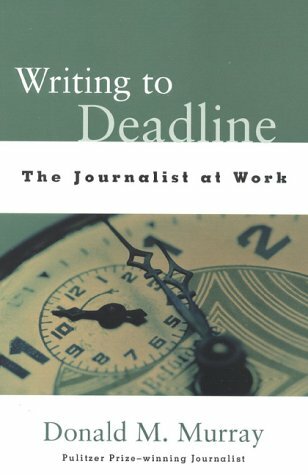 Another, more recent gem that I’ve been reading is Donald M. Murray’s Writing to Deadline: The Journalist at Work – my copy was published in 2000. In the book, Murray, a Pulitzer Prize-winning journalist, covers topics as diverse as the journalist’s craft, writing before writing and development of journalistic pieces. As well as a healthy dose of experience-based advice, the book also includes a fascinating selection of interviews with journalists where they talk about writing. Though the book is primarily aimed at professional journalists, there are gems that will transform the way anyone writes for business. In particular, I was struck by the chapter titled ‘DEVELOP: Work on What Works’ where Murray discusses the process of developing a draft document. If there was one thing that jumped out from this chapter, it was Murray’s assertion that writing will take a huge leap forward if, when revising a draft, you focus not on what is wrong, but what is working – what is right. By doing so, the improvement on an original draft is accelerated and, interestingly, most of the problems of early drafts will solve themselves. Those that aren’t can be more easily isolated and worked on. It’s a radical change from the idea of focusing on what’s wrong with a document. Murray also advocates thinking about revision, not as a punishment for failure, but as an opportunity. Sounds a bit like the old ‘challenges, not problems’ thing, doesn’t it. Is this for real? I guess it is. It is print journalist tradition to avoid the first person (in fact, the capital letter I had been filed off all the Royal typewriters in the old Boston Herald city room when I arrived in 1948). Although Murray then goes on to state that there is an occasional place for the first person in journalistic writing, I just liked this anecdote and it is a great reminder of the importance of writing directly to your reader – and talking about them much more than about you! So there you go, a few thoughts prompted by a trip back in time into my copywriting library. If you have to develop draft documents, you could do worse than invest in a copy – even if you only read Chapter 7, it will be worthwhile. What’s the most important lesson you’ve ever learned about copywriting or editing? feel free to comment below. This entry was posted in Business writing tips and tagged claude hopkins, david ogilvy, donald murray, gloucestershire copywriter, journalism, journalistic writing, my life in advertising, revision, schlitz beer, scientific advertising on May 7, 2014 by alwrites. Actually, this was the last thing I needed as I tried to get back up to speed after three weeks away. But it is just so engaging and irresistible. Who remembers Tracy Chapman and classic songs such as ‘Fast Car’ and ‘Baby Can I Hold You? Well, Tracy’s website is currently promoting her new album, called Our Bright Future – with a twist. Playing around with the colour palette and colouring in those clouds and houses (and the birds and plane if you are quick) reminded me of how I often help clients get draft copy completed when they have roughed out some copy ideas but haven’t the time to finish the work. I call it copy-editing PLUS and it’s another example of how I help businesses and individuals write the copy they don’t have the time, specialist skills or inclination to do themselves. Just as the Tracy Chapman website sets up an outline framework ready for colouring in, so I can take your outline copy and add the ‘colour’ it needs to work effectively online or in print – often without the cost of ‘from scratch’ copywriting. That’s enough about me. If you need a bit of colouring-in therapy, visit Tracy’s website and be hooked (I take no responsibility for the effect on your productivity)! On the other hand, if you want a hand getting copy off your to-do list, please contact me. This entry was posted in Uncategorized and tagged copy-editing, copyediting, gloucestershire copywriter, our bright future, tracy chapman on April 7, 2014 by alwrites. I was excited when NLP specialist Paul Goddard offered to share seven powerful words with us at Win-Biz Networking recently. What Paul said resonated with me – I’ve been aware of this for a long time and regularly use these (and other) powerful words in my copywriting. Persuasive copy, containing powerful subliminal messages, needn’t be restricted to ‘high pressure’ American-style sales letters. 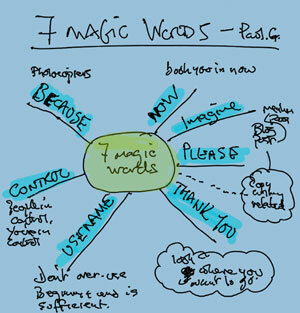 Used judiciously, the seven ‘magic’ words have an important place in B2C and B2B copywriting – and the written communications we use every day at home or work. So what are these amazing words? Paul used the oft-quoted example of the 1970s research involving a photocopier queue, and how the researcher’s ability to jump the line increased markedly when they added ‘because I need to make copies’ to their request. This is sometimes referred to as ‘the photocopier effect‘. The lesson? Whether in written or spoken communication, using because strengthens the persuasiveness of your case. It could be on your website homepage or your next email. Either way, used with subtlety, this is a powerful word. As every direct-response copywriter knows, now adds urgency and encourages action from the recipient of your message. This, as John Lennon’s songwriting has proved for decade, is a wonderful tool for getting someone to think ahead and envisage a scene, a benefit or a feeling. By asking your reader to imagine something, you can put any idea into their head. Got it? Great! Now imagine using this technique in future. Because basic courtesies still matter. You’d say please in conversation, so why on earth wouldn’t you do so when you write. Please remember this next time you write. For the same reason as above. Thank you! Another subtle one to be used with discretion. We all like to feel in control, especially when we’re trying something new or being asked to make a commitment. That’s why, as writers, it makes sense to remind your reader that they are in control. They will have control. And so will you. I don’t mean for every other word as is so beloved of sales people who are trying too hard. What I mean is the judicious use of someone’s name to personalise your communication. When Paul Goddard spoke to us he was using the example with reference to spoken communication, but the same applies to writing – by addressing a spec-approach to a named individual , rather than to Dear Sir/Madam, for example. In copywriting, where you don’t know the names of all the people who are reading your brochure or website page, you achieve a similar effect by using ‘yo’u and ‘your’s in your copy. It ties in with the idea of writing as we speak, of communicating directly with the person who is reading your copy at that moment. As well as personalising your message, use of more ‘you’ than we, emphasises that your message is more about your reader than you. That’s important. You will do this in your writing won’t you. So there they are, seven powerful words that you can start using today to enhance your written and spoken communications and give you subtle control – that’s because they work. It takes practice to deploy them effectively in your business writing. That’s why an experienced marketing, technical or SEO copywriter might be your new best friend. If you don’t have the time, special skills or inclination to write your own SEO copy, brochure content or client case studies, imagine the benefit of some professional help. If that’s the case for you, please contact me now. In any case, please leave a comment after this post and tell me which words you find most powerful when you communicate – and why. This entry was posted in Copywriting ideas, Copywriting Resources and tagged bear, bear on a jet ski, copywriters cheltenham, gloucestershire copywriter, jet ski, networking, nlp, paul goddard, persuasive copywriting, photocopier effect, powerful words, seo copywriter, winbiz on February 20, 2014 by alwrites. Do you listen to the radio while you work? Have you ever been writing or editing a document while the radio is on and noticed that a word is spoken just as you type it in your document? I’ve noticed this over the years and it’s happened enough that I’m fascinated why it occurs. Combining background music or radio with writing or editing is a controversial and very personal subject. We all have a different view on its usefulness (or helpfulness) of background music or radio. Most of the time I’m creating new copy or editing, the most demanding thing I’ll listen to is Classic FM or Classic Radio Suisse. Often, I’ll even switch everything off and work in silence – it depends on the job. I usually reserve spoken-word radio for less demanding writing or editing because it can be distracting. But over the years I’ve noticed that I surprisingly frequently type or edit a word just as the same word is mentioned in a radio programme or podcast. Why is this? So far, I haven’t been able to find references to this happening elsewhere on the Internet – maybe I simply haven’t been trying hard enough. I’d be interested to hear whether you’ve noticed this phenomenon or are aware of anything else that’s been written about it. If so, please tell me about it with a comment. This entry was posted in Uncategorized and tagged background music, copywriting, distraction, editing, gloucestershire copywriter, listening to radio, radio on February 3, 2014 by alwrites.